Saw news of an interesting book and just had to comment. Cooking with Pooh: Yummy Tummy Cookie Cutter Treats The tongue in cheek title caught my eye, but I ended up not getting it, as he wasn't that familiar with Winnie-the-Pooh just yet, and he just wouldn't get the joke. 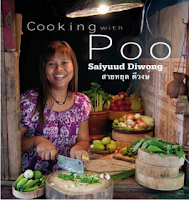 Cooking with Poo is a Helping Hands initiative. Helping Hands supports Klong Toey residents to develop micro-businesses based on their skills and talents by linking them with markets and credit support. Other projects that have been supported by Helping Hands include catering services, , a sushi delivery business, handicraft production , a fresh food delivery service, two Thai dessert business, a coffee stand and a soon to be opened café/restaurant. The book is even award-winning, albeit for the Diagram Prize for Oddest Book Title of the Year. The 100 page book has an ISBN of 9780977507078, but appears not to be available from Amazon. You can buy the book from the book's web site, along with an apron that says I Cooked with Poo and I liked it! 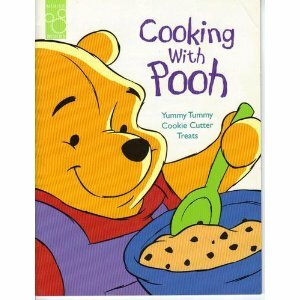 The title is pretty darn funny, and you've gotta love the apron idea, I mean hey, might as well go with it! I'm thinking I've found a gift for my brother... I'm not sure I want to ask how you stumbled upon this book, but did you actually get the book? I have not gotten the book, but I was tempted to get the apron, too, as a gift. I don't recall where I saw the book first.